There’s no such thing as all work and no play in these flattering cropped black pants. Slip into them for the best of both worlds! In soft mid-weight drape fabric, a pleated waistband, AND pockets, they do it all. At the pinnacle of polka dotted fashion, let them do the talking for you at your next work presentation or wear them out for a night at a comedy show. Be careful--you may feel the need to get on stage yourself! Style these playful pants with a chic crop top for extra sass and finish the look off by renting a rose gold metal headband. Add a bright lip for an energetic vibe full of personality! Hire these for any occasion calling for a little extra flare. For more style inspiration, visit our blog post ‘Autumn Racing Style Guide’. Pair with a basic white tee or Camilla and Marc's Loren Top. 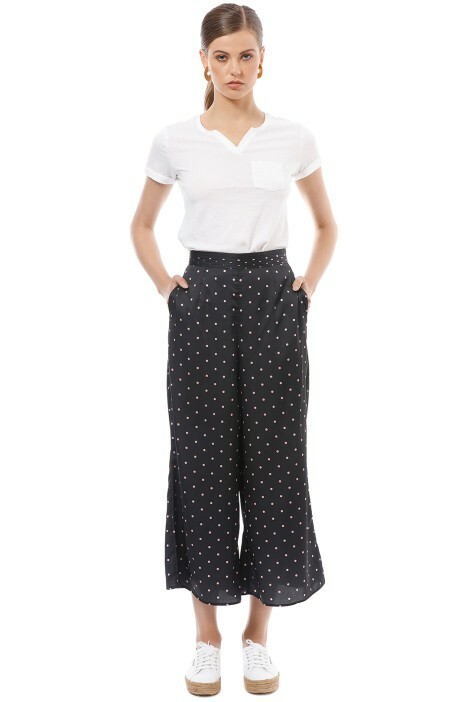 LENGTH: This pant is ankle to floor length.